This blog post takes a close look on how the security services market can benefit from location-based features. The designed features below increase the safety for event visitors as well as for security guards on duty. The solutions facilitate the communication and ease the administrative tasks related to security missions. The security services market size has increased significantly over the last couple of years. According to Statista, for the first time ever, the market size for the security services reached over 100 billion U.S. dollars in 2017. Europe, followed by Asia and North America were the largest markets. A large majority of the market is based on services, while a smaller part consists of hardware and software services, according to Brand View Research. Some parts of the security services market are rather ineffective as of today. For the security guards in many companies, the only mean of communication when on duty is the walkie talkie. As a result, there is often a lack of a global view of the missions, and locating an incident as well as dispatching guards effectively can be an issue. Moreover, the usage of the walkie talkie tends to saturate communication lines and a majority of messages are not relevant to all guards on duty. Last but not least, the billing is not always accurate: it's difficult to know the exact amount of time the guards have spent on a mission, and as a consequence it's complicated to send precise invoices to the client. 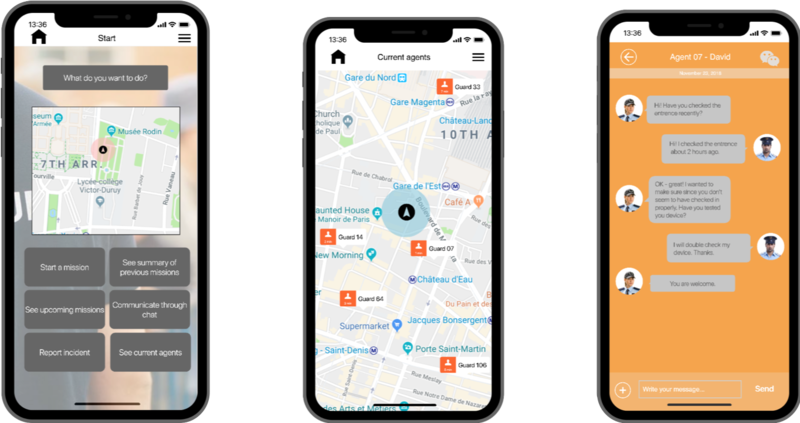 There are many solutions on how you can improve the services with location-based and proximity features for security companies. We have decided to present three of our ideas below. They are incident reporting, automatic shift reporting and current mission overview - all ideas are location-based solutions. Our solutions bring a lot of value for large outdoor events with a lot of visitors involved. However, the solutions are also well-suited for indoor missions, as for example to testify that security guards have passed certain checkpoints. This idea is probably best described by an example. Let's assume there is a visitor at a large in/outdoor event, which is in need of some kind of help from a security guard. The visitor, or his/her friends, can use the app to report the incident based on the location. The closest guard on duty receives a message in form of a notification, and will be able to accept or reject the mission depending on the guard's availability. The first phone shows the screen of the participant of the event. This functionality can be integrated either to the festival's app, or the app of a security service. The visitors will be able to report any incidents based on location. The second and third images show the screens of the security guards. 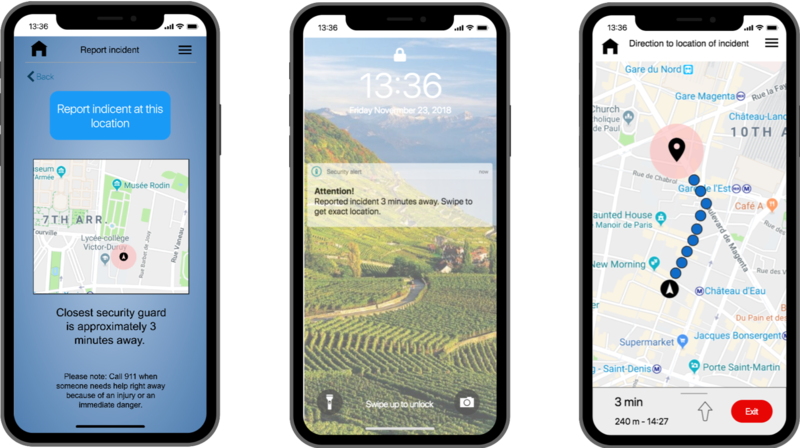 The security guards will receive a notification when there is an incident reported, and it's possible to get direct directions based on the location. A great usage of proximity-based matching is to make sure the security guards are at the right place at the right time. When the guards arrive to the location of their missions, they will use their phones with its location and check-in to the missions. The guards will do the same when their shift are over. By matching the guards' location with their work site, the billing department can easily keep track of the guards' working hours. The guards do not have to report any hours manually, as long as there has not been any special use cases. The security guards will be able to see an overview of nearby missions through a map when they are about to start their missions. While doing their patrols, the security guards have to pass checkpoints to fulfill their missions. This can be confirmed by using geolocated fences or by scanning QR codes as well as approaching NFC tags. They can also report incidents, such as broken windows, based on location directly through the app. The last screen shows a possible summary of a security guard's latest missions. Another use case of location-based features for security companies is a real-time mission overview. Let's assume, again, there is an event where there will be several security guards at the same time in the same area. Today, the main mean of communication is through walkie talkies. If there is a large event, with thousands of visitors, it might be difficult to achieve an equal spread of the security guards. Thanks to a map overview with real-time location of security guards, it will be possible to spread out equally and provide solid safety and security throughout the area. The proximity chat also allows communication to all security guards within a designated area, or to all guards who are currently close to an incident. 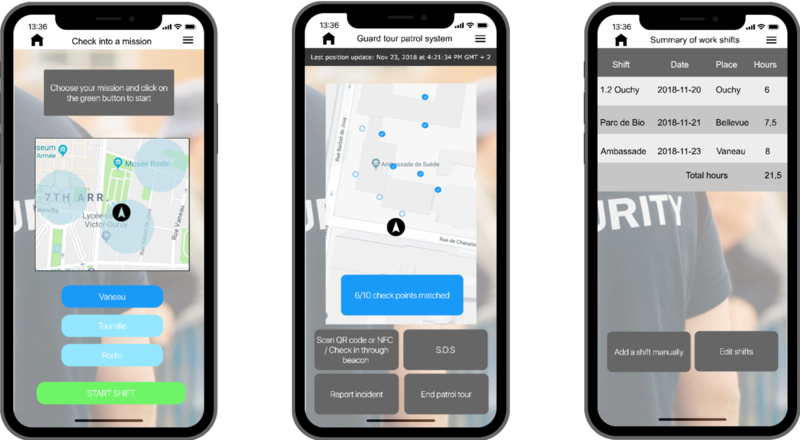 When a security guard uses the location-based app, he or she can also see other connected security guards on duty nearby in real-time. The solution also provides a proximity chat so the security guards can communicate with each other, also based on location. Both the real-time app as well as the proximity chat can be used by the manager, even if he or she is located remotely. It's possible to track security guards based on their GPS location. If you are interested in our solution, please contact me at sofia.bjorklov@matchmore.com or my colleague Michel de Marsano at michel.demarsano@matchmore.com.